The former Cumberland Presbyterian Church, at Main and Santiam, the way it looked on May 27. 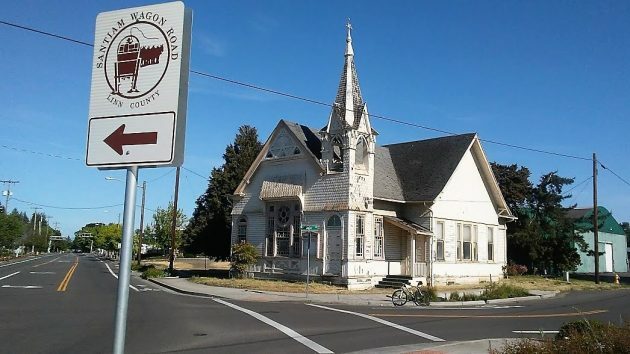 Once again the Albany City Council will be asked to decide what if anything to do with the former Cumberland Presbyterian Church at Main Street and Santiam Road. Last year a work group assembled by Mayor Sharon Konopa came up with a proposal to have the building moved to a city-owned parcel near the skate park at Eleanor Park and restore it as a community center. But the idea stalled because a council majority was reluctant to spend tax money on the move. Now, Ed Hodney, director of parks and recreation, says he has been asked to present options for the building at a council work session on June 11. What options? He replied he was still working on that. The city spent $150,000 to buy the building 18 years ago, in 2000, intending to move or demolish it to make room for a street project. But when the Main Street project was done in 2014, the property wasn’t needed after all. In February 2015, the council agreed to give the building to a charity for $111. The charity wanted to raise money to turn it into a counseling center but didn’t follow through, and the city retained ownership. At the time the council did not consider an offer from someone who wanted to turn it into a wedding chapel. The building dates from 1892 and has been vacant since the city bought it. In recent years it has been rented, as storage, to the Universal Coffee shop across the street. #3 – but make an honest attempt to salvage at least the big support wood. Valuable commodity these days. Such a beautiful building that needs to be restored. While I am partial to Gothic Revival churches, the fact that this is a Queen Anne makes it more unique for saving, as it is a rare example of this architectural style. why would it need to be moved? i thought that was only for a previous plan for the road expansion that they decided was not needed. is turning it into some sort of community service center still on the table? The shortcoming of the present site is said to be the shortage of off-street parking. Don’t tear it down. Use CARA money to move it. That’s a hell of a lot better idea for CARA money than pouring it into bulb-outs and funky lights and the carousel downtown. Or, if CARA (the city/they are one and same thing) won’t move it, let someone buy it for a wedding chapel. This is a historic building for Albany and should be preserved. The White Spiers church has no parking either save our city heritage and make an exception for this lovely old church. The Hackelman District is also an important and charming part of our city and should be recognized and saved from being torn down and replaced. CARA money should not be for just downtown Montheith District. Our city is growing and Hackelman District needs to be helped from becoming a blithed run down area of Albany. Save our heritage City Council and care about those of us who live in this area and love the church and old homes. It could be a fun home for someone even. Please save one of the oldest buildings and it’s history. I want it! I wonder if there would be a loan available to Reno it-and turn it into a home? It’s a beautiful piece of history worth saving. Mr. Andersons idea sounds best. Craftsmen are always looking for clear material to work with. So many people ready to spend other people’s money for their pet projects. Tear it down. Just like the Trumplican governing party at the Fed level ? Grifting trickles down I suppose. How about selling it to a private party. They can rent out some of the unused parking spaces across the street. We should present it to McMenamins to turn it into a pub. They’ve restored dozens of old buildings across the state. I’m all for saving it!